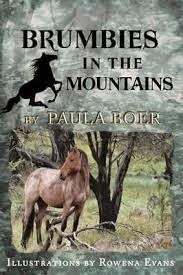 In the fifth book in the Brumbies series, Paula Boer brings her gripping story of teenagers Ben Naylor and Louise Hardy and their love of horses, their adventures and challenges to its conclusion. Once again the brumbies are in danger - this time from aerial culling by shooting them on the run. The story opens with Shadow giving birth to a filly sired by Ben's brumby stallion, Brandy, caught two years ago when the friends were determined to save at least some brumbies from being caught and turned into pet food. Ben has dreams for the future, one of them is building his own stud, and with the arrival of the little palomino filly, Peach, the first step has been taken. On the first day of the Christmas holidays, Ben and Louise set out for a ride and discover first-hand the devastating results of shooting horses from the air. A dead mare lies covered in flies attracted by the blood of a shoulder wound. Nearby is a foal attacked by ticks and thus too weak to stand. With great effort the friends drape the small filly over Louise's mount, Jake, and then Louise rides ahead on Snip to leave a note for Harry the hermit to come to the farm and give them his expert advice. The incident also needs to be reported to the ranger and hopefully will influence a stop to the aerial culling. Ben's worry that his Dad's health will mean selling the farm and living in town has been pushed aside for the moment. Ben's problems often consume him and Louise bears the brunt of his testy nature. But she understands what pressure he is under, and her readiness to overlook his unkind moments when her own future is uncertain invites the empathy of the reader. Once again the author's love and experience of horses and knowledge of the Australian bush landscape provides an authentic touch to wrap up her absorbing series. Children who may not have read the previous books will have no difficulty in enjoying Brumbies in the Mountains. The characters of Ben and Louise are fully rounded and the reader engages easily with both. My impression is that the author's ability to maintain tension and interest which has always been effective, has increased in this concluding book. Solutions to both Louise's and Ben's problems are credibly and smoothly executed. Ben's plight weighs on the reader's heart right to the last chapter, and the final outcome will please and satisfy. Rowena Evan's black and white illustrations are simple but very effective and I was thrilled to learn what a black sallee was from the helpful glossary. I had often wondered on the drive from the coast to Canberra what a street name, Black Sallee, meant. For those interested, it is a type of eucalyptus tree. The Brumbies series will stay a long time in the memories of its readers and will provide a valuable source of information for young horse lovers to refer to in the future.